Features Electric operation provides smooth, consistent pressing action. 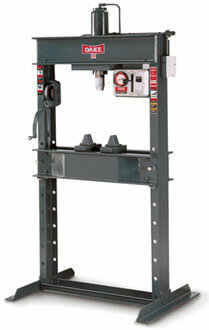 Single-acting cylinder models provides fast, reliable pressing and internal spring return. Double-acting cylinder models permits pulling as well as pressing ram action. Rapid ram return starts ram return as soon as release valve is opened and may be stopped at any point by closing the valve.